Usually, custody and visitation are decided or agreed upon early in the divorce or separation of parents. However, things change and mothers and fathers are sometimes forced to go to court to argue why the existing arrangement is not in the best interests of the child. One of the most difficult issues facing people who are getting a divorce has been the issue of who should be given physical custody of a child when custody is in dispute as well as visitation decisions. In New Jersey, our statutes make it clear that in a proceeding involving the custody of a minor child, the rights of both parents shall be equal. 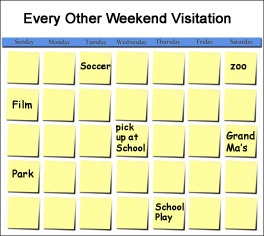 Because each family, every child, every parent has unique and specific needs and schedules every effort should be made to negotiate a workable visitation and custody arrangement. There are two types of custody: physical and legal. Legally speaking, the only presumption is that both parents will have legal custody and physical custody that is in dispute. Despite the neutrality of the law, usually the courts agree that the best interests of the child is to let the mother have physical custody. Any other factors the court may deem relevant such as the residence, both primary and secondary of your child or children; If you and your former partner or spouse desire rotating custody; a visitation schedule; how you and your former spouse or partner will make decisions which affect your child or children. Overall, when determining child custody and visitation matters, it is important to carefully consider your children's current and future needs, keeping in mind each parent's economic situation and potential, caretaking ability and availability, as well as your child's bonds with their other siblings. If you need to determine child custody or visitation issues as you begin the dissolution of your partnership or marriage, are currently in the process of determining child custody or visitation, or if you are having problems or issues with a court-ordered custody arrangement, we can help. To set up a consultation concerning any child custody and visitation matter, contact us online or call us at (201) 656-1000.